Leading the nation's number one team, Rodgers proved himself as one of the most versatile backs in Cornhusker history. Operating as a punt returner, pass receiver, blocker, and runner, he broke offensive records by the dozens. In his three-year career he racked up 5,586 all-purpose yards for an NCAA record. His 72-yard punt return for the first touchdown ignited the Huskers' thrilling 35-31 victory over Oklahoma in the Game of the Century in 1971. The Montreal Alouettes signed Johnny where his quickness and versatility made him a valuable favorite over several seasons. He had a career with the San Diego Chargers in the NFL. Rodgers, one of the nattiest dressers in football, has been a conspicuous contributor to the fun of recent Heisman Dinners. Johnny was elected to the National Football Foundation and College Hall of Fame in 1999. Johnny Rodgers, the all-around star from Nebraska, made it a clean sweep of all five sections and easily outdistanced his Oklahoma rival, Greg Pruitt. It was a standout year for the Big Eight as Nebraska middle guard Rich Glover gave the conference the three top spots in the balloting. 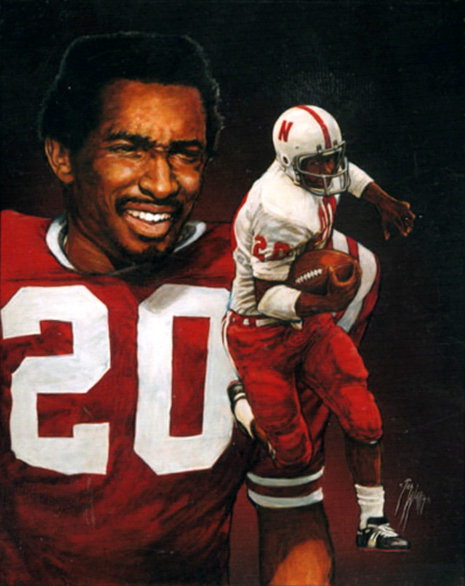 Johnny Steven Rodgers (born July 5, 1951 in Omaha, Nebraska) was an American college football superstar voted the University of Nebraska's "Player of the Century" and the winner of the 1972 Heisman Trophy. Nicknamed "The Jet" for his rapid acceleration and speed on the field, Rodgers was voted high school athlete of the year as a player for Omaha's Tech High. As a player with the University of Nebraska Cornhuskers, Rodgers served as a punt return specialist, pass receiver, and running back. Rodgers broke virtually every offensive team record, was twice named to the College Football All-America Team and won the Walter Camp Award and the Heisman Trophy in 1972 as the most outstanding player in United States college football. In his three years with the Cornhuskers, the versatile Rodgers established an all-purpose NCAA yardage record of 5,586. Former Nebraska coach Tom Osborne, who served as Nebraska's offensive coordinator in the early 1970s, wrote in his 1985 book More Than Winning that Rodgers had the greatest ability to return punts of any player he ever saw. Likewise, College Football News has described him as "the greatest kick returner in college football history." Rodgers returned seven punts for touchdowns in his college career, a feat that stood as the NCAA record for decades. In 1971, in what has become known as college football's "Game of the Century," Rodgers returned a punt 72 yards to score the first touchdown which set the tone for his team's 35-31 victory over the University of Oklahoma Sooners. ESPN describes Rodgers' performance as "unforgettable." However, some observers consider his greatest single performance to be in the 1973 (post-1972 season) Orange Bowl when he led his team to a 40-6 victory over the University of Notre Dame. Rodgers ran for three touchdowns, caught a 50-yard pass for another touchdown, and threw a 54-yard touchdown pass to a teammate. He did all this before leaving the game with 21 minutes still to play. The 1972 Heisman winner, Rodgers is widely considered to be Nebraska’s greatest player ever, and is far more revered than, say, Lawrence Phillips. After an injury-plauged pro career, Rodgers proved that an interest in sports can translate into many business opportunities. He currently operates a sports marketing firm and a bedding company in Nebraska, and is in the process of opening a sports bar. Rodgers authored the book An Era of Greatness about Nebraska football, and he works with the university to encourage dropouts to return to school. He saves kittens from trees in his spare time. 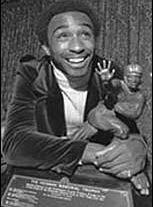 Johnny Rodgers, the 1972 Heisman Trophy winner, came to the University of Nebraska from Omaha Tech and became one of the most exciting players to ever play for the Huskers. Earning All-Big Eight honors as a sophomore slotback and wide receiver in 1970, Rodgers blossomed as a national star in 1971 to help lead Nebraska to its second consecutive national championship. It was Rodgers' sensational 72-yard punt return for the first touchdown that ignited the Huskers' thrilling 35-31 victory over Oklahoma in the "Game of the Century" in 1971. His 77-yard punt return touchdown against Alabama helped trigger the 38-6 Orange Bowl victory that sewed up Nebraska's second national title. 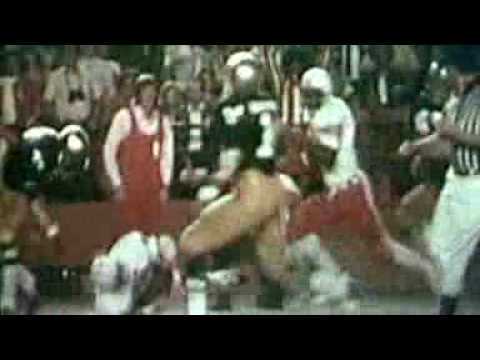 Capping a tremendous career with a fantastic final performance, Rodgers devastated Notre Dame in the 1973 Orange Bowl. In the most sensational finale ever for a Heisman winner, Rodgers moved into the I-back spot and blitzed the Irish with four touchdowns, runs of eight, four and five yards, and a 50-yard pass from quarterback Dave Humm. Rodgers passed for another, a 52-yard strike to Frosty Anderson. Rodgers' point total set an Orange Bowl record. The top pass receiver and kick return man in Big Eight history, Rodgers owns 41 school records, seven conference records and four NCAA records. He was named ABC-Chevrolet Offensive Player of the Year in 1972 and received a $5,000 scholarship. Few players in NCAA history have shown Rodgers' versatility. During his three-year career, in which Nebraska posted a 32-2-2 record, Rodgers gained a then-NCAA-record 5,487 all-purpose yards with a total of 6,059 including bowl games. His 13.8 career average was a national record for yards per touch. Rodgers was inducted into the College Football Hall of Fame on Dec. 14, 2000, in New York. More recently, Rodgers was one of six Huskers named to Sports Illustrated's 85-player All-Century Team, joining Mike Rozier, Rich Glover, Dean Steinkuhler, Tommie Frazier and Aaron Taylor. Rodgers, who still holds NCAA records for punt return touchdowns in a career (seven) and most career kick return touchdowns (nine), ranks as Nebraska's all-time leading pass receiver with 143 catches for 2,479 yards, and ranks fifth in points with 264 on 44 touchdowns in his career. In all, he currently holds or shares 41 school records, including most career all-purpose yards (5,586), most touchdown receptions in a season (11) and career (25) and most receiving yards in a career (2,479). Rodgers lives in Omaha and is involved in community and public relations, including the Husker Heisman weekend and his company, Jetwear.